When I began using the Ouija Board in 1973 I used it under these assumptions, while adhering to this type of séance form of communication. I proceeded this way until I “stumbled” upon communication with other types of sentient beings, including the higher self, angels, guides and ethereal beings. In the middle of one such session in 1996, while communicating with my angel, she told me that someone had a message for me. She precisely said, “You aren’t going to believe this.” What happened next, was a message coming through the Board from a distinctly different energy than my angel, as the planchette slowed down, changed directions and felt directed. The planchette spelled out a message for me: “Hermes cat I love you.” Well, lo and behold, my very much alive orange tabby cat named Hermes, who was sitting in a rocking chair near the table where my partner and I were working the Board, engaged in communication with me! 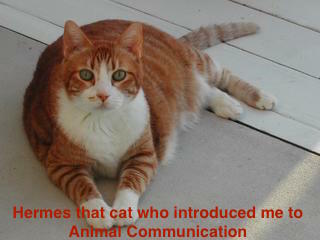 It was an incredible experience because I was now aware of the possibilities of communicating with my cat, Hermes, my very much alive cat. This showed me another facet to this incredible, far-reaching tool, meaning I could easily and readily communicate with animals while using it regardless of their position within what we call “life.” Needless to say, this opened a whole new world for me. That day, January 26, 1996, I commenced my journey communicating with many animals, both dead and alive! Well, why not? We just need to match the frequency of the sentient being. To this day, I continue to communicate with the animals via the Board and also, sans the Board. I found it to be a natural progression for me. Animal communication is an innate process and we do it all of the time with our household pets, whether we are fully conscious of it or not. They are constantly sending us messages. However, if you would like to learn how to communicate with your pet and quite possibly other animals, whether in physical form or spiritual form via the Board, here are a few pointers for doing so. 1.) Be Open – be open to the possibilities for this type of communication to occur from either alive or deceased pets. 2.) Ask and Allow Assistance – ask for your pet to come forward in communication and/or ask for one of your “go to” spirits to assist with the communications and translations from the animals. 3.) Hold the Image – within your mind’s eye and heart, think and feel what it’s like to be with your pet and connect with him or her. Recall those images and feelings. 4.) Be Patient – allow them the freedom to come forward with their communication without expectations for what they might say or how they might communicate. 5.) Thank and Reward – remain positive with their attempts at communication. Remember, this is not their way. They often find this silly, but will do so to please you. Let them know that you are appreciative. 6.) Every Day – view your pet as a sentient being able to communicate with you at a level where you both will be able to understand each other via this new tool for them. Continue the conversations with your pet away from the Board. 7.) Develop your Sensitivities – when away from the Board, endeavor to hear and feel your pet’s communications with you. Sit with your pet and just be in a silent space with him or her. Often they will speak to you in images. Don’t judge what comes to your mind and heart; just allow it to flow. 8.) Back at the Board – these messages will become more verbose as you develop this open communication with your pet. You will find that the Board is just one way to communicate. It can develop to the point where you can literally receive downloads of information from your pet while sitting with him or her and you will be able to understand the meaning of the communications. As a final point, my most recent cat I adopted that came to me off the streets with no one claiming him, decided to communicate with me via the Board. I had been wondering what to name this young male cat. While sitting at the Board with a partner and conducting a session, on his own volition, this cat decided to join us. He plopped himself down on the floor four feet from where we were hosting this session. All of a sudden, the planchette changed direction and energy. It spelled out, “I like the name Bear.” I looked at this young white cat laying on the floor staring back at me and asked him, “What is the name you went by before you came to me?” He replied, “George.” This newly adopted cat renamed himself via the Board and from that moment on, his name became Bear. Once you become comfortable with this type of communication, your pets will desire to communicate with you this way in addition to their way. They know only unconditional love and will do all they can to add to your efforts. They truly want to please you while living their existence. We can most definitely learn so much about unconditional love from our pets, especially when we take the time to connect with them. I just discovered your blog and I’m eager to read it! Here in France, one can’t use a oui-ja board easily, first because it is not very well known, except in Hollywood horror movies, and they are hard to find and purchase (I bought mine on e-bay in the USA-I made a ritual of exercation, then of consécration with Holy Water – I’m not sure of the English words, sorry!). I’d love to communicate with my dog and my cat, I didn’t know it was possible! Thank you for sharing your experiences and advice. I’m patient, and ask my friend from beyond to help me! A million thanks again! Hi Claudia. You nailed it when you mentioned how most of our expectations and relationships to the “ouija board” has been because of Hollywood! You are so spot on with your approach to this tool. When we remain at the helm of this tool work, we will engage and explore such incredible realms! hi Karen, just wanted to ask what you thought about these angel boards? Hi Jan! I find ALL Boards equal for me and that’s because they are ONLY tools. So, whether it’s called an “Angel Board,” “Witch Board,” “Ouija Board,” etc, they are all the same. If an Angel Board calls to you, that that will help you, the operator of the Board, to feel comfortable and thus, raise your vibration to make contact with the desired energies. So, use the Board you are most comfortable with and that can help you with the communications. Oh, Karen! This topic is right up my alley! I also communicate with animals…mentally. I have done this all my life, be it a domestic pet, wild or captive animal. It is so natural to me just like breathing in and out. I never thought communication with pets through the board was possible until I read your article! You just opened a door for me with this. I hope to do some brain picking with you, I am so intrigued! You are truly a rare find! Yes, many of us were able to do this “naturally” as children. Now as adults, the Board may assist us to open this door again. Once aligned or realigned with this form of communication, it will change the way you view the animal kingdom. As witness to this amazing form of communication I feel lucky to have spoken to them and hear the things they have to say to us and the love they have to share.